Many of you probably know, but in case you weren’t aware, yesterday was the first night of the Jewish holiday of Hanukkah. This year it was our turn to host a dinner for the holiday, and so as always I turned to my well worn copy of “Fast & Festive Meals for the Jewish Holidays: Complete Menus, Rituals, and Party-Planning Ideas for Every Holiday of the Year” by Marlene Sorosky. Every time I flip through her book I always come across something new, despite how many times in the past I’ve looked through the darn thing. This year, as always, her book didn’t disappoint! Sorosky is quick to point out that traditional foods associated with Hanukkah are related to the miracle of oil. Ahhhh, the miracle of oil. Normally that makes people think of latkes, potato pancakes. We tried her Giant Potato-Carrot Latkes which were delicious and required someone to carve them at the table! However it was her mentioning doughnuts that got my attention. I hadn’t really thought about it, but yes, fried doughnuts certainly would qualify as a food related to oil. She suggests using them to help create a Menorah centerpiece, but I thought, why couldn’t they be dessert? Even better, I’m still on a pretty restricted diet, so instead of genuine fried doughnuts, couldn’t we use our nifty little baked griddle baby doughnut maker that our friend bought us? Jim has gotten really good at making all kinds of versions and despite the lack of frying, symbolically our dessert would be righteous. Right? Well, I don’t know if we’ve started the next newest Hebrew craze, but I present……. 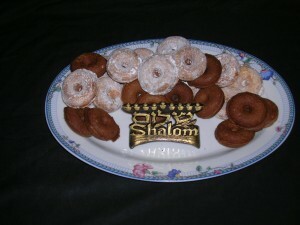 Or should they be, Shalom-nuts? To those who celebrate, Happy Hanukkah! Previous postJust Think Happy Thoughts!